Whilst researching World War I, I have identified other people who enlisted pre the outbreak of the war and others who joined during the war who returned to their families. I have included all of them identified in this document. It was not only in the towns and large villages that people enlisted. 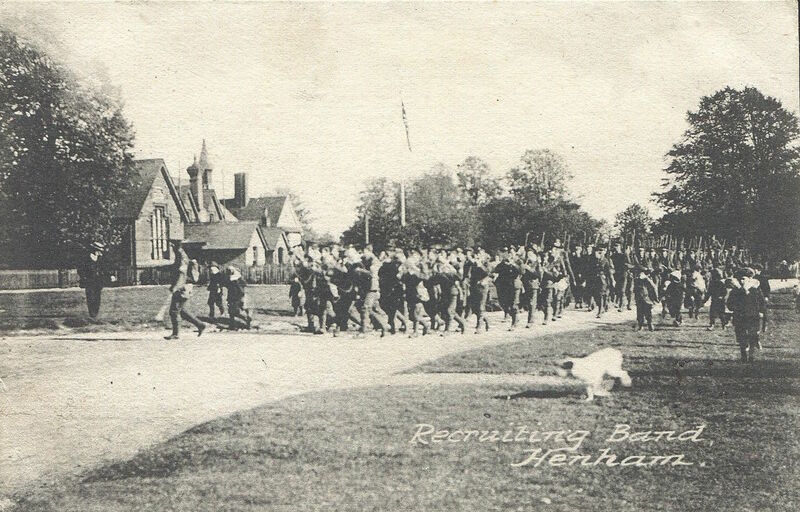 On 19 May 1915 a number of men enlisted in Henham from the surrounding area. As you will see from the postcard, the military came out to encourage the young men to join the war effort. Where I have identified more information I have created a hyperlink. BENTLEY Frank Service No. 17561 7th Battalion Bedfordshire Regiment Bishops Stortford Born in Henham, Essex. Resident in Broxted. Died 25th March 1918 in Flanders. BENTLEY Frank, Private died 25/03/1918 aged Service Record 17561 Bedfordshire Regiment 7th Battalion. Remembered at Pozieres Memorial. BENTLEY William Arthur Service No. 250925 Essex Regiment 5th Battn. Henham He is remembered on Panels 33 to 39 Jerusalem Memorial. BLACKWELL William Frederick 20 yrs 11 mths Belmont Place, Newport, Essex Private, 3rd Batt. Essex Regiment. Warley 25 Jan 1915 born Henham, enlists twice. BRAND William George William was the son of George and Elizabeth Brand, of Woodend Green, Henham, Essex. Private, 12th Battalion East Surrey Regiment Saffron Walden, Service No.33201 A reference from the war diaries was that at Bois Quarante on 4th September 1918 an early morning attack was planned to begin at 04.00am. Killed, 21 years, in action on 4th Sept 1918 Flanders. Remembered at Voormezelle Enclosure No. 3 Cemetery. BUSH Ernest 23 yrs 6 mths Bigglewade, Bedfordshire Machine Gun Corps, No. 2nd Company 11th Dec. 1918 at Biggleswade born 1895 Henham, market gardener. CAMP Charles 18yrs Henham, Essex 3rd Batt. Essex Regiment 9 May 1895 born 1877 Henham. He bought himself out 19 Feb 1896.
born 13th March 1884 although previously claimed 1890 of Pledgdon Green, Henham. CLARK Henry Frederick George Pledgdon Green, Henham Service no. 4/6893 Bedfordshire Regiment 2nd Battalion. Died 25 Sept 1915 aged 21. Remembered at Loos Memorial. CLARK Robert Pledgdon Green, Henham Service no. 7485 Bedfordshire Regiment 1st Battalion. Bishops Stortford Died 22 Oct 1914 aged 32. He is remembered at Le Touret Memorial. David Cooper Snr. of Lodge Farm, Henham applied for his son, David, age 28, It was agreed he could be exempt for three months to assist his father on his 83 acre farm. DENNISON John Peter aged 22 Henham Royal Tank Corp 11 Oct 1926 Maidstone born 11 June 1904, previously employment labourer. Son of Edward and Harriet Dixon of The Row. DUNN Horatio Service No. 33411 87th Squadron RAF. Died 01 Jun1940 Aged 23. FISHER Stanley 2nd Bn. Royal Fusiliers. Died 12th May 1917. Age 22. Buried at Duisans British Cemetery Etrun. Son of Elwin William and Annie Elizabeth Fisher formerly lived Henham. HAMMOND Arthur 19 years and 2 months Service no. 8315 1st Battalion East Surrey Regiment. 08 Sept 1914 Bishops Stortford Died 10/10/1917 aged 22. Remembered at Tyne Cot Memorial. Son of Mrs. Emma Jane Woodcock of Old Mead Cottages Henham. HAMMOND Walter 18 years and 7 months Service No. L14106 Duke of Cambridge's Own 13th Battalion Middlesex Regiment. Mill Hill on 05 Jun 1912 Died 10 Oct 1918 aged 28. Buried at St. Aubert British Cemetery. HARGRAVE Walter 14 years 6 months Royal Artillery service no. 11164. Scarborough on 7 Sept 1895. HARMAN Ernest Northumbrian Fusiliers May 1918 reported as a prisoner of war in Germany. NAPIER Robert David Bacons Farm Henham Sub-Lieutenant (A), Royal Naval Volunteer Reserve, on board H.M.S. Ruler in the Pacific Ocean. Died age 21, 6 June 1945 states that he was killed during operations at sea. RICKETTS Joseph 16 yrs Gunner and Driver, 3rd Batt. Royal Regiment of Artillery 17 Mar 1814 Woolwich born in Henham, Essex; trade groom. Served for 28 years 194 days. SAMPFORD H. W. Henham Essex Regiment Chelmsford Chronicle published Friday 14 Sept 1917 shows him as wounded. SNOW Nelson Arthur 35 yrs 1 mths Alsa Wood, Stansted, Essex Pioneer (Roadman), 121st Labour Company 13th Feb 1917 Saffron Walden born in Henham; married Ellen Minnie Davey 24 Apr 1909 Henham, Essex. TURNER Albert Thomas Service No. 34144 Essex Regiment 9 Battalion, formerly 2611, Essex Saffron Walden, died 07/04/1918 aged 25 Buried at St. Hilaire Cemetery Extension Frevent. TURNER Ralph Victor 19.10.1891 Age 24 born Henham Service No. 12169 Army 32 Squadron 1 Nov 1915 Occupation carpenter wife May marries 19.12.1916 at Markby near Alford Lincs. WESTWARD William 21 yrs Henham 1st Battalion of the 6th Regiment Infantry Regiment 18 Sept 1841 Cambridge 11 years and 8 months at Cape of Good Hope. Discharged at own request after 21 yrs of service. WHITE Percy Service No. 10763, Essex Regiment. Essex Newsman on 12 Aug 1916 as wounded but survived the war with his brother Ernest. WHITE Walter Essex Regiment, 10th Battalion. Saffron Walden Died 20 Jul 1916 aged 23 brother of Ernest and Percy. WILSON Thomas George Sergeant, service no. 56002, Royal Welsh Fusiliers, 10th Battalion. Formerly 13214, Essex Regiment. Saffron Walden Died 17/06/1917, aged 28.The 1901 census records Henham as his birthplace.